We all crammed into the truck and headed home for the holidays. Of course I love Oscar, but Stewie is one of the coolest cats I've even seen. He's adorable in his little shirt! 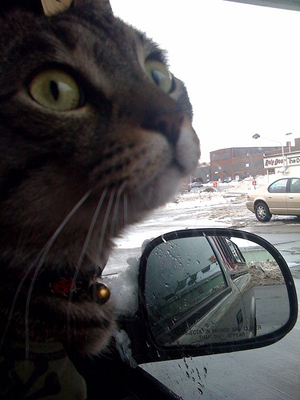 My cat just panics in the car. I could never take her on a road trip like that. Wishing you all a very Merry Christmas and safe travels! Colin wants to know if Stewie loose in the car and how does that work? His old cat Hugo actually busted OUT of a carrier in the car because he was so freaked. Your pets are wonderful. Nearly makes me want to get a new dog. 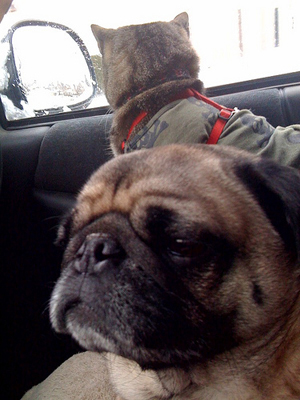 (ours passed away) Do they ride in the front seat with you behind them? I am not sure which is the case, does Stewie think he is a dog or does Oscar think he is a cat? is there info or a post some where on how you got Stewie to like riding in the car? i would really really love to take my cat out with me on rides. i see Stewie has a harness, is this the trick to getting him to stay in the seat? he seems pretty calm. 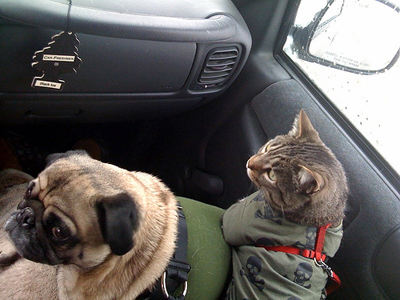 We never did anything special to get Stewie to ride in the car. He has always liked it. He likes to look out the window or curl up and sleep. He is a strange kitty.